Let's try to understand the Quicksort algorithm, as always, our intent here is, NOT to write the most optimal implementation of Quicksort, but to dissect the algorithm and learn it, so that we will be able to remember it for a long time. Most of the work is done in the partition phase, it divides the array into two subarrays with elements less than pivot in lower subarray and elements greater than pivot in upper subarray. The sort phase simply sorts the two smaller problems that are generated in the partition phase. Don't bother, if you don't get the above description, we'll get into the details, by the end of this article, you'll be able to implement the Quicksort algorithm on your own. The tricky part about the algorithm, is to understand the partition phase correctly. So let's spend some time first isolating the problem and implementing the partition phase first. All elements less than value of the index element, is in the left side of the given index. All elements that are greater than the value of the index, is in the right side of the given index. array[index] = 5 the value, in the above array for given index 4. All elements, less than 5, to left side of the index(4). All elements, greater than 5 to right side of the index(4). In the above we said an index is given to us, one way to arrive at an index/pivot is as below. In process let's also initialize some more indexes/variables, we'll be using in the rest of the code. Here is the pictorial representation of the above array with the pivot index highlighted. Lets start from beginning of array, find an element greater than 5. Do not go beyond the pivot index(4), i.e. 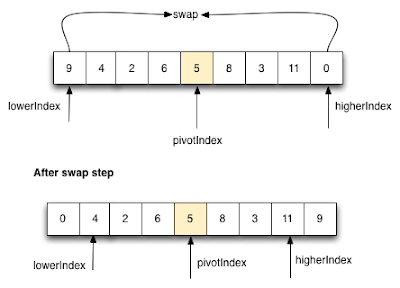 search from index 0, to 3. So, we have the below index called 'lowerIndex' identified. Now lowerIndex has the correct value, initially we had set it to 0 the beginning of the array - It happened by coincidence that element at 0 is greater than pivot index in this example - However it need not be the case always. Here is the code snippet that does this step. Continue step 2, 3, & 4 until all the elements less than 5 is in lower part of the array and all elements greater than 5 are in upper part of the array. Here is the final state of the array - We have no more elements to which satisfy our step4 condition, so the loop just finds NO more elements to swap - so, it completes after iterating without any changes to array. Having covered all the sections - Here is the complete sample partition code of Quicksort - Its nothing but all above snippets put together as a function and some indexes being passed as parameters to the function rather than we computing. System.out.println("Partitioning around index : "
System.out.println("(Elements less than : " + pivotValue + ")-----then "
Why not return pivotIndex ? I am sure, if you workout the indexes on a paper you'll get the reason behind it. You can also download the code attached below and try it. Pick an element, called pivot, from the array. After partition we can think it as , We have 2 sub arrays, one array with smaller values than pivot and other with larger value than pivot. Recursively apply the above steps to the two sub-arrays i.e. Apply Quicksort for the sub-array of elements with greater values. Let's implement the above algorithm - The only condition added to the code is to make sure we have a exit condition for the recursive function, rest is direct mapping of the above algorithm text to code. In quicksort, in the partition phase we pick an element called the pivot in each step and re-arrange the array in such a way that all elements less than the pivot now appear to the left of the pivot, and all elements larger than the pivot appear on the right side of the pivot. So what is the complexity of partition phase its : O(n) - Since we need to iterate over all the elements of the array to move/swap elements as compared with the pivot. Its is important to note that once partition is complete we say a pivot element is the right place of the array, the position of this pivot element in the array will remain unchanged for all subsequent iterations. In quick sort, the best case scenario occurs when we choose an pivot element that splits the given array into 2 equal subarrays, i.e for an array of 'n' elements. The partition phase produces two subarrays of length n/2. The worst case scenario occurs when partition is done such as one sub array is of size 1, and other subarray is of size (n - 1). Quicksort's performance is dependent on the pivot selection in the partition phase. The most naive way to choose a pivot is to, just choose the first element in the array as the pivot. This results in worst case behavior if the data is already sorted (the first element will always be the minimum in this case). In our code, we had chosen the pivot to be the middle element of the array. The complexity works out to : O(n​2​​) for worst case and O(nlogn) for best case. For the exact derivations please check this link. For more details on general complexity analysis please check out this article on how to find the complexity of the given code. Here is the complete code of the sample QuickSort. The code has 2 versions of Quicksort implemented one which is used in this article and other a cleanup and optimized version which you typically see on all over the web with comments for easier understanding. * Quicksort is a very efficient sorting algorithm invented by C.A.R. Hoare. * 2. the sort phase. * and elements greater than pivot in upper subarray. * that are generated in the partition phase. * A clean version of partition implementation - same as samplePartition().